Cancellation of the mandatory service and turning the IDF into a professional army will end the "cultural war" against hareidim, says MK. MK Rabbi Yisrael Eichler (United Torah Judaism) said on Monday that the mandatory IDF service should be cancelled and that the Israeli army should be turned into a professional army. This, he said, would bring to an end what he termed the “cultural war” between secular Israelis and hareidim. 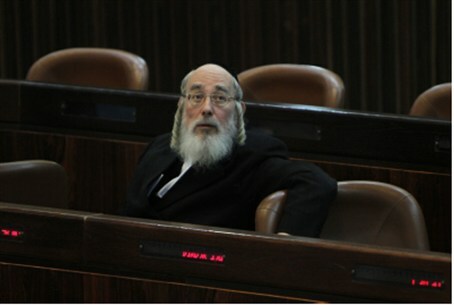 Eichler’s comments come as the government faces its first coalition crisis over the planned drafting of hareidim. The Perry Committee for Equal Burden of Service abruptly ended a meeting on Sunday night after an argument between the chairman of the committee, Science and Technology Minister Yaakov Perry of Yesh Atid, and Defense Minister Moshe Yaalon over the issue of criminal sanctions against hareidi yeshiva students who evade army service. Yesh Atid demands that, once a 4-year transition period is over, hareidi men who dodge enlistment face criminal sanctions, but the other coalition partners want the sanctions to only be financial. Bayit Yehudi chairman Minister Naftali Bennett urged members of the government and MKs to show understanding and stay calm until the problem can be resolved. Bennett said that the process of bringing hareidim into the army and the workforce – after a decades' long exclusion from both – would require time and patience to work properly. “No one wants to see the Military Police invading Bnei Brak and making arrests," he said, in reference to Israel's largest hareidi-majority city. "This will not solve anything. On the other hand, a slow and intelligently-implemented process of benefits, coupled with a great deal of love for the hareidim to integrate them into the greater Israeli society, is what is needed."